Also known as GPRS. Mobile communication system for transfering data. Most likely used by Telematics applications such as AutoAlerts real time vehicle tracking system. Faster than 2G but lower priority traffic for the mobile networks and patchy coverage. Third generation European mobile telephone communication standard. Also known as UMTS. Data transfer standard for wireless local area networks. 802.11a works at up to 2Mbps, 802.11b works at up to 11Mbps whilst the latest 802.11g standard works at upto 54Mbps. 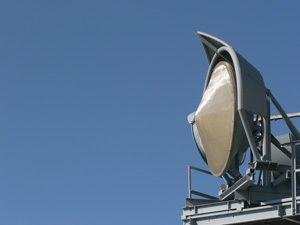 Asymmetric Digital Subscriber line is a way to transmit data over standard telephone lines at speeds approaching cable. Application programming interface is often offered by companies to allow third party developers to create programmers which link into other systems. Automatic Vehicle Location is provided by companies such as AutoAlert to help people monitor, protect and better manage their vehicles. A short-range wireless radio technology that aenables wireless devices such as mobile telephones and accessories to connect to each other. A wiring network within most new vehicles which connects all the electronic devices within the vehicle. A digital communications technology (code division multiple access) for mobile telephones. Differential GPS which is augmented by ground based signals. Digital Enhanced Cordlesss Telecommunications is a way of transmitting voice traffic for domestic phones and some business phones. EDGE is an enhanced way of transmitting data over GSM networks at up to 384Knpt. Enhanced observed time difference is a way of synchronising signals for GSM positioning. The European Telecommunications Standards Institute is responsible for agreeing standards. FMS-Standard is a system drawn up by Truck manufacturers to provide standards governing data formats for capturing and exchanging information on vehicle systems and particularly for passing it over on-board CANbus networks. The Global Positioning System is a network of 24 satellites based on the US governments network. By using the signals transmitted by these satellites, the position on the earth can be calculated by systems such as AutoAlert. General Packet Radio Service or 2.5G allows for faster data transmission over the GSM network. Data transfer speeds range from 56Kbps to 115Kbps. AutoAlert uses GPRS to transmit real time information about vehicle movements. Global System for Mobile Communications is the technology behind the 2.0G network. GSM can be implemented in 900MHz, 1800MHz or 1900MHz. Hypertext Mark Up Language is used for programming web pages. Ingress protection is a rating system developed by the International Electrotechnical Commission to describe the ability of electronic products to withstand gas, dust, water and overall dirt penetration. The higher the number the better the protection. IP also standards for Internet Protocol. Infrared Data Association is a protocol for sending infra red data between two devices. Integrated Subscriber Digital Network allows data transfer rates of 2x64Kbps It has now been widely superseded by ADSL. JAVA is an object orientated programming language developed by Sun Microsystems. It is ideal for network applications and applets as it is operating system independent. Location Based Services include such services as AutoAlert’s vehicle tracking systems, Multimap’s mapping systems and location based advertising. Mobitex is an open wireless networking standard used especially for data transmission. It can operate at 80MHz, 400, 800 and 900 MHz (usually 400MHz in Europe). There are over 30 networks operating in over 22 countries with Transcomm being the UK system. The copyright is held by Ericsson. Open Database Compliance is a way for programs to connect to Databases. Personal Digital Assistant are basically a scaled down computer which allows for computing on the move. 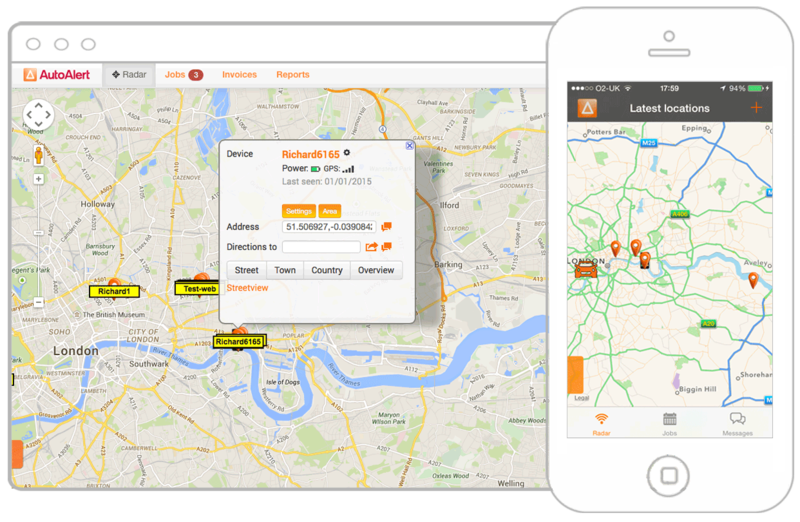 PDA’s with internet access allows fleet managers to see the location of their vehicles whilst out in the field themselves. Private Mobile Radio is a licence free short range radio technology operating between 446.0-446.1 MHz. Private Virtual Networks are used by Businesses to create a secure private network over the public internet. Radio Data System – Traffic Message Channel is used to convey real time traffic information and radio station information to FM radios. Radio Frequency Identification is a very cheap and short range communication system which allows such things as the tracking of palettes and the identification of drivers using a small card. A Sim is the small chip which goes inside most mobile phones and tracking units and contains information about the subscriber. SIM stands for Subscriber Identification Module. The Short Message Service is a system used to transmit short text messages up to 160 characters long on GSM networks. It was originally used by mobile phone technicians using spare capacity but has grown in popularity wtih billions of messages sent per week. 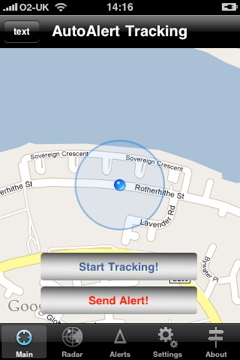 AutoAlert uses SMS to send proactive alerts to customers and to send messages to and from units as a back up to GPRS. Terrestrial Trunked Radio is a land based mobile radio communication standard. Time Division Multiple Access is a way to send digital data over systems such as GSM at high frequency. The Universal Mobile Telecommunications System is the European third generation cellular mobile standard also known as 3G. UMTS is the overall system whilst W-CDMA is the technology behind it. Wi-Fi stands for Wireless Fidelity and is a brand name adopted by the Wi-Fi Alliance which currently has over 200 members. The Wi-Fi alliance promotes 802.11 local area network specification and asserts compliance with it. Voice Over Internet Protocol is a way to transmit voice data over the internet. A virtual private network is often used by companies to set up a private network over a public system such as the Internet. Extensible Mark Up Language is a flexible programming language which is used by companies such as AutoAlert to exchange data with other systems such as Google. Wireless Application Protocol first allowed the internet to be viewed on mobile telephones. 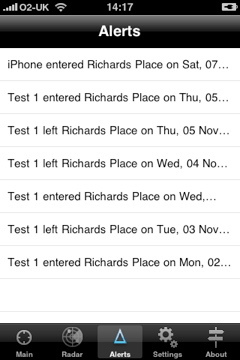 AutoAlert uses WAP to provide vehicle location information to basic mobile telephone. Wireless Virtual Private Network. As VPN, just wireless. Thanks to the Telematics and Mobile Data Guide 2008 for some of the information on which this guide is based. Better car safety? Simplicity itself…. It’s not often that the forces of IT and agriculture are united, but in its quest for agrarian supremacy, North Korea has devised a novel (if slightly odd) method to help educate its children in the ways of farming. 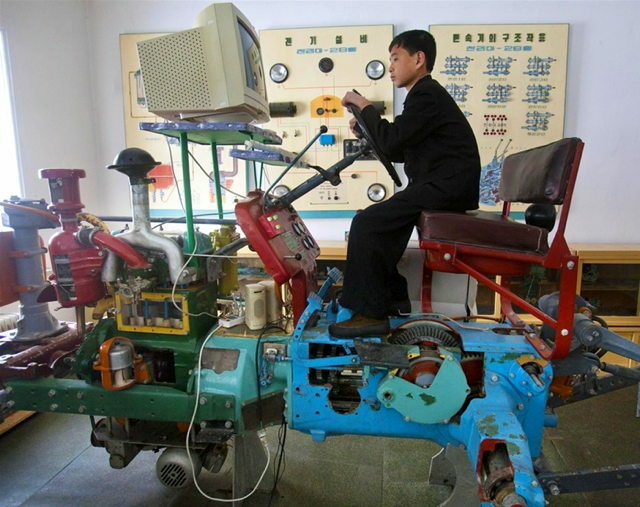 Using an ’80s style monitor along with the gutted chassis of a Soviet-era tractor, it has created a unique computerised simulator in an attempt to help school children learn the ways of their forefathers. Admitedly, it lacks the form factor of the latest GPS devices, but it does have a certain retro charm. Despite its somewhat Heath Robinson appearance, the contraption apparently makes a dramatic difference in a school curriculum which has a strong practical emphasis on trade skills and vocational work. Pupils learn how to plough virtual fields whilst their counterparts in Europe learn how to mow down innocent pedestrians via the likes of the popular video game, Grand Theft Auto. Okay, perhaps that’s a slightly implausible comparison, but it is somewhat indicative of a disparity between our respective cultures. Moreover, it begs the question of why we aren’t more proactive in our use of technology in the quest for safer roads. The driving test has incorporated a hazard perception assessment for a good many years, but the process hardly replicates experiences on the road. Watching a selection of video clips and clicking a mouse button when you see a dangerous (or blindingly obvious) situation is hardly representative of modern driving conditions. For today’s youth, it may be slightly more realistic if it was done under the influence of a Greggs’ stake bake, whilst thumbing through a Sat Nav menu and composing a text message. With such a multi-sensory world of gadgets and computer tech, it’s little wonder that as many as twenty percent of young drivers have had an accident. In fact, a recent study found that some 13.2% of 17 year old drivers and 12.85% of 18 year old drivers have been involved in collisions. This is considerably higher than the average 6.5% across all other age groups for a similar one-year period. So, what’s to be done? Well, I’d humbly suggest that the use of sophisticated simulator technology could make a considerable difference to the safety record of the nation’s youth. Although we often hear stories of irresponsible driving at silly speeds, such situations are, thankfully, the exception. According to Direct Line, the primary cause of accidents amongst young drivers is lack of experience. This leads to either a dangerous overconfidence, or a panic situation, where a lack of familiarity with the road ensures bad situations get worse very quickly. The solution, it would seem, is to allow young drivers to clock up more hours practice without putting them in harm’s way. Commercial airline pilots need to log in more than 250 hours’ on the flight deck before they get their license and even then, they’ll be accompanied by a senior first offer or captain until they get to the point they can command their own airliner. Of course, airplanes are slightly more advanced than the humble motorcar, which certainly doesn’t cost anywhere near the amount of your average 747 (unless you’ve just filled your tank, in which case it comes close). Finding an effective and inexpensive system that accurately recreates some of the scenarios today’s young drivers are likely to face surely isn’t beyond the scope of man. So perhaps it’s time we invested in rolling out a series of driving simulators that will let young drivers rack up a few more miles without the exorbitant costs of driving lessons…or filling up at the forecourt. If the boss of Ford has predicted correctly, within a decade motorists might be driving like a pilot flies an aeroplane: by switching to a GPS powered autopilot. Bill Ford Jnr is the great grandson of Henry Ford, the guy who transformed the car from a rich man’s toy to everyday transport within reach of millions. He has announced his vision for the future after declaring that dramatic advances in technology will be needed to cope with the global rise in cars from 1 billion now to 4 billion by 2050. Apparently some of these advances are already in the pipeline, fuelled by this prediction. I daresay, if this autopilot facility catches on, we would then dispense with hands free mobiles as we’ll have our hands free anyway. Mr Ford was addressing the 2012 Mobile World Congress in sunny Barcelona. “Cars are becoming mobile communications platforms,” he said. “Right now there are a billion computing devices in the form of individual vehicles out on our roads. They’re largely unconnected from one another and the network. We’ll increasingly take advantage of the car as a rolling collection of sensors to reduce congestion and help prevent accidents. I guess it’s fuel for thought and sceptics will automatically dismiss the idea as they did Satnavs and GPS devices. The birth of this new generation has already happened. Ford’s B-Max is being launched at the Geneva motor show and goes on sale in September in the UK. This family car is the first in Europe to be fitted with new SYNC mobile technology which automatically alerts the emergency services in an accident. 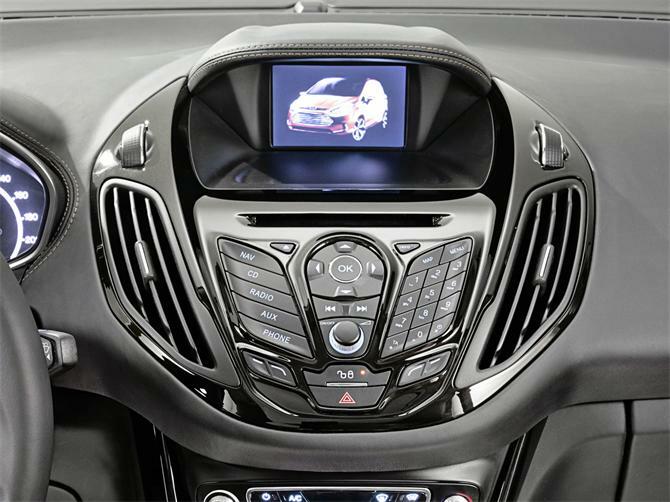 Drivers can also use voice commands to control the in-car entertainment system. It’s unclear just how many will steer clear of this new technology. As with so much techspeak nowadays, it’s easy to misunderstand, feel ignorant or just turn away from new systems on the market, as being too complex to need. A Global Positioning System (GPS) might well feature in this category. For many of you, it may seem more suited to an astronaut than to the average, busy mum. Why would an everyday consumer need a map navigation device? Well, are your children constantly tempted by the lure of independence? Do they often wander off, leaving you fretting? If the recent case of a mother who tracked her grown up son through his global gap year tour, is too much for you, you may feel more comfortable knowing where your younger children are. Does your daily job often involve vehicle journeys? Do these mean travel to remote, out-of-town spots or late at night? With a GPS, wherever and whenever you are stranded or in danger, at a touch of a button whilst remaining in your vehicle, you can send an alert to get rapid emergency help. Most of us have been at a crowded theme park or other tourist attraction, at home or abroad, when you discover you have become separated from your tour group, family or friends. Yes, even as adults, it happens. Well, let a GPS find them for you, and in the blink of an eye you’re reunited. Then there are the times when you take your elderly relatives out for a pleasant day trip. What happens? They become submerged in a throng of people who all begin to look the same. Whilst you are thinking they are ‘just behind’, you lose sight of them and it all gets a bit hectic. Supposing you were abroad and no one speaks English? How about the teenager who follows you around whilst you visit your favourite museum or historic building? They are bored, miserable, wishing they were somewhere else. So let them go somewhere else. With your GPS unit you can let them venture off on their own, cool. Later on, even in an unfamiliar place, you simply find their whereabouts. Travelling a long road distance to get to a coastal port, airport, relative or friend? Plan your drive to visit local points of interest, campsites, quaint pubs, restaurants. You can view your favourite places that may not be listed in a tourist guide. Oh, and how about the blissful security of knowing where your luggage is whilst travelling? GPS use can be limited, depending on connections to the satellite feeds when indoors or blocked by an obstruction. However current development of new technology will improve this. Why not write in and reply to my ideas? Tell me about your everyday experience, when a GPS would have really helped. 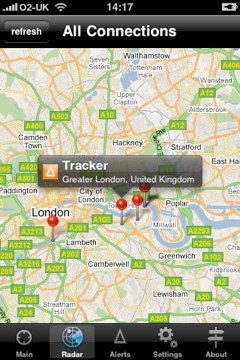 Find out more about GPS Tracking from AutoAlert and how it could benefit your business.